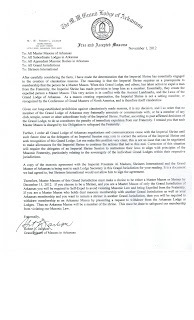 You know, when dealing with issues between a Grand Lodge and Imperial, I as a default will side with a Grand Lodge because Shriners accept Master Masons as a prerequisite to membership but it is that Grand Lodge who makes the final determination as to who is designated a Master Mason. But with regards to this particular issue, Imperial had taken the time to inform us in a clear and methodical manner as to what is transpiring in Arkansas. The letter was well laid out, and it not only explained their position in this matter but provided documentation to offer unbiased clarity for us to deliberate. As such, I am of the opinion that the Grand Lodge of Arkansas appears to be initiating a witch hunt against many good Brothers and Shriners who are their sons. 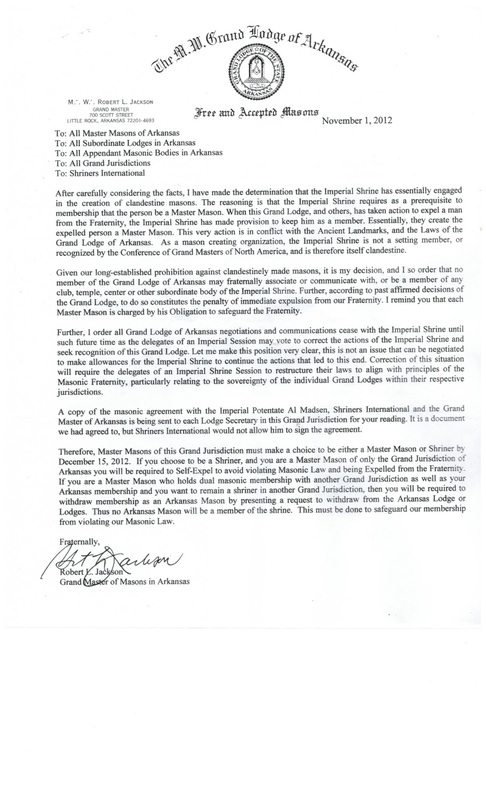 I am also of the mind that Imperial in this case is actually acting as an agent of good, and with great sincerity has attempted to resolve this matter with Arkansas as many Grand Lodges have requested of the Imperial Potentate. I could be wrong, but it is seeming that the Grand Lodge of Arkansas did not respect the ruling of one of their own subordinate Lodges, but instead decided to interpose themselves with the intent of running an unfair trial by stacking individuals who were directly involved and had clear motivation in the trials final outcome. My prayers to the Brethren and Shriners of that grand jurisdiction and hope that they can find a way to resolve this issue and will be able to clean their house with regards to this mess. I wish the best to them. Ah! Interesting! If you are an Arkansas mason who has dual membership in a lodge you are OK. So I can stand up in my lodge (in North Carolina) next week and say "Worshipful Master, I move that all Master Masons who are card-carrying members in good standing of any lodge of the Grand Lodge of Arkansas be made honorary members of this lodge." 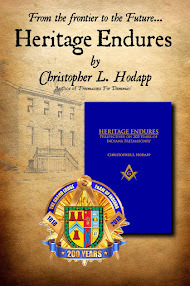 Then they would not be considered clandestine since that are made Master Masons by the Grand Lodge of North Carolina. Read that letter again, Bro. Eric, it isn't quite so simple. If they wish to remain in the Shrine they must give up their membership under the GL of Arkansas. If they are dual members in another jurisdiction, they STILL must drop their AK membership. I am not familiar with the regulations of the GL of NC, but I have to wonder if they would recognize an Honorary membership as still valid for someone who is no longer a regular (or full, or whatever you want to call it) of a regular (i.e. not a lodge of research, etc.) subordinate lodge working under any Grand Lodge. It was stated previously on this blog that the man expelled in Arkansas was also a member in Iowa. Did Iowa also expel him? Worshipful Richard, the GLofNC would likely not permit this as almost every Grand Lodge will respect the grand jurisdiction itself. The turf belongs to the GLofAR and the two shrine temples resides within. Any large-scale "honorary" affiliations from one turf as such would certainly get any Grand Lodge's attention. Grand Lodges are not going to get involve overtly into any disputes and will most likely not permit any of their subordinate lodges to thrust them into the mix. They will be very brotherly and work with the disputing parties but you may never see it. Let us pray that calmer heads shall soon prevail so that our Arkansas brethren can get back to work doing ALL the labors that makes our fraternity great. Based on the reading of the first paragraph, I cannot come to any other conclusion that the Grand Master of Arkansas has absolutely no idea what he is doing. I cannot understand the unwillingness of the GL of AK to work toward a resolution of the issue, but instead enter into discussions with the Imperial Shrine from a position of authority over the Imperial Shrine, where no such authority ever existed previously. The Imperial Shrine is a separate body, branched off of Freemasonry, and it's been accepted as such since its inception and recognized by every US Grand Lodge whenever a Shrine has been consecrated in their respective jurisdiction. The Grand Master's idea of reverse psychology to somehow validate his actions isn't any worse than the original issue that caused this rift between the Grand Lodge and the Imperial Shrine to begin with. 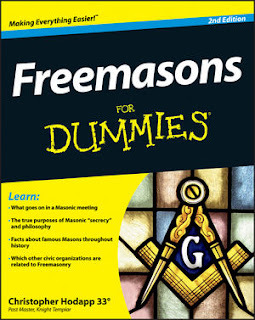 Sure, we as Masons have an understanding the what and the why this has occurred, but I hope the G.L. of AK can explain to the parents of children who depend on the Shrine Masons of their state why they can no longer accommodation them in the future. In the Grand Master's poor attempt to throw his weight around, he apparently didn't see those who aren't as tall as his waistline, the ones in the wheelchairs and on crutches. The original actions of one man, and how he was dealt with by the G.L. and the I.S. was a tempest in a teapot compared to the current actions that now sets Arkansas apart from the other 49 states. "Welcome to Arkansas, where we are the ones who originally invented Masonry, and not that other area of the world that you've been told about. We take pride in making up the rules as we go along, and if you don't like it, then you can leave". I am only concerned that if this is what is identified as happening in Arkansas, who is to say how much further from there this will carry? How many more states will fall under this? I am not a Shriner but I have a hard time thinking this was limited only to Arkansas Shriners exclusively. I have to hope for a speedy resolution. The incredible leap that the Shrine is making Master Masons is a joke, and absolutely not the case. This just goes to show how ridiculous this has become. As a Noble and a Mason, I find this very disturbing. I love Masonry and Shrinedom. When I was Created, there was no rift to speak of and they were related organizations under the umbrella of Freemasonry. Although I am not from Arkansas, it makes me think that it might cause me to give up on Masonry all together, as this or thse organizations are no longer worth my time and effection. Just my thoughts. So does this automatically carry over to the ROJ as well?